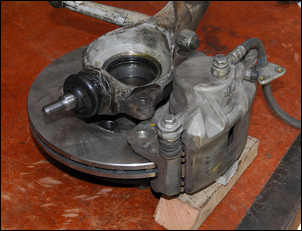 If you are looking at fitting bigger front brakes, there are some traps that are easy to fall into. That’s especially the case if you are mixing and matching components – calipers from one car, discs from another, and front knuckle assembly (upright) from yet another! In that situation, how do you even go about selecting the parts? The first step in picking mix-and-match brake components is to have available the wheels that all the brake bits need to fit inside. In broad terms, the diameter of the wheel will determine how much space you have available. 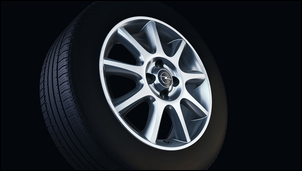 For example, a 17 inch wheel will have more space inside it than a 16 inch wheel. However, you also need to have available the actual wheels you will be using. This is because, even with the same overall diameter, wheels vary in internal dimensions from model to model. These variations include offset and internal clearance to the spokes. Many brake upgrades will run tight clearances to the wheels, so you must have the wheels selected and available before you start picking brake components. 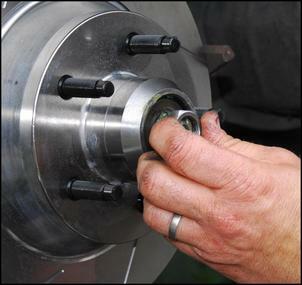 In most cars, the wheels spin on bearings that are integrated into the hub, in turn mounted within the knuckle assembly (the upright). This assembly also carries the brake caliper mounting lugs, and in wishbone suspension systems, the upper and lower ball joints. The steering arm also connects to this assembly. In short, without re-engineering the entire front suspension and steering, you’re stuck with this bit of the car! The brake upgrade – disc and caliper – therefore need to works with the existing knuckle or upright assembly. The disc is centred by its centre hole being a close fit over a hub protrusion. This centre’ing is important as the wheel nuts (or bolts) are insufficient to accurately centre the disc. The holes in the disc mounting flange are a match for the holes in the wheel – that is, the number of studs (eg four or five) and the pitch circle diameter (PCD) are the same for the disc and wheel. 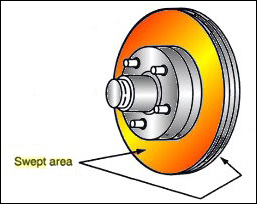 Discs use an offset, where the mounting face of the disc is not in line with the centreline of the friction surfaces of the disc. This measurement is often indirectly expressed, with the total height of the disc (measured from the underside of the disc to the top of the top hat) being used. Discs vary in thickness, with solid discs being thinner than ventilated discs. Finally, discs vary in overall diameter. 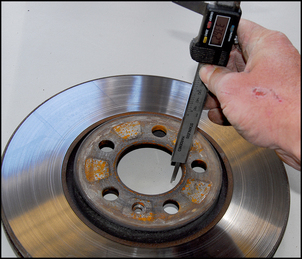 The rubbing width of the friction surface of a disc also varies. This is important to realise, as a 300mm disc with a large diameter top hat will have a narrower rubbing surface than a 300mm disc with a smaller top hat. 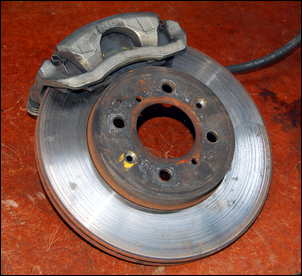 Older cars use a different disc mounting system. 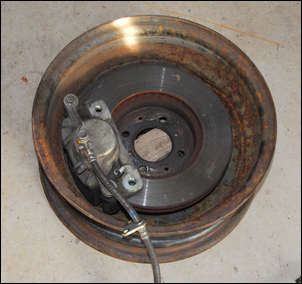 In many of these cars, the discs bolt to the back of the hub. In these cases, the number of bolts and the PCD of those bolts do not need to be the same as the wheel studs. Still other cars integrate the wheel bearings into the disc assembly. 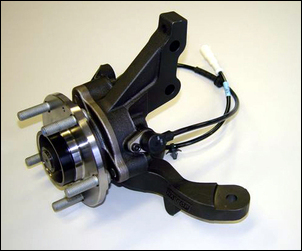 Brake calipers come in a variety of designs – two pot, four pot, single pot, sliding and non-sliding. 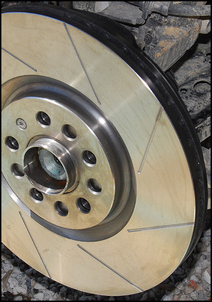 However, from a brake swap point of view, the most important aspects are the diameter and thickness of discs with which they were originally matched. Next most important is the width of swept area of the original discs. Brake calipers mount to the knuckle or upright. 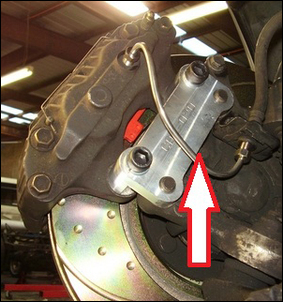 These mounting holes are specific to the caliper – change calipers and most frequently, the holes will no longer line up with the calipers. The holes in the new caliper may be wider apart than the originals (most common when going to larger calipers), or they may be too close together. They are also likely to mount the new caliper so that it no longer centres on the new disc, requiring a different offset in the custom mounting bracket. Working out the order in which to select parts can be a bit ‘chicken and egg’. You have your wheels - now do you select the disc or caliper next? In most cases, you will want to fit the largest disc that will go into the available space. But the ‘largest that will fit’ also depends on the caliper you select – even for the same size disc, some calipers are much bigger than others! In many cases, this confusion will start naturally sorting itself out. You may already have a pair of calipers you want to use. Or, there is a limited number of discs with the right stud pattern and offset that can be bought – so the max disc diameter ends up largely suggesting itself. Let’s look at a real world scenario. I wanted to do a brake upgrade on a car – in this case, an old car: a 1960s Austin 1800. 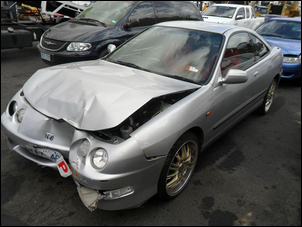 I bought a complete Honda Integra donor car for the brakes and other parts. I then had the new calipers. However, because the Honda has modern discs that fit over the hubs, and the Austin has old discs that fit behind the hubs, I knew that the Honda discs wouldn’t actually be used. But whatever the discs I ended up using, their diameter would need to be much the same as the Honda. By placing the Honda disc caliper (complete with pads) over the standard Honda disc, I could then see how large the overall disc/caliper assembly would be. By inverting a removed Austin wheel and placing this caliper/disc assembly centred within the wheel, I could then see if it would fit within the rim. To go further – since the knuckle assembly and hub were off the car, on the bench I could mount all the bits temporarily within the wheel and eyeball clearances. Doing this showed that there should be sufficient clearance to the required 14 inch (standard steel) wheels. The Honda discs are 262mm in diameter, have a 45mm height, a 21mm thickness and a centre hole 64mm in diameter. So how do you find other discs that are like this? The answer is to use a brake disc catalog that contains these specs for lots of discs - I use the Disc Brakes Australia downloadable catalog. If the Austin had modern discs that mounted on the front of the hubs, the next step would have been to find new discs of the right diameter, offset, centre hub hole, thickness and wheel mounting PCD. All but the last specification is available in the Disc Brakes Australia catalog – it’s just a case of going through the specs, one by one. In the case of the Austin, where the discs mount to the back of the hub, I knew a custom adaptor would be required to match the mounting holes of the new disc to the Austin hub. Therefore, the location of the mounting holes of the donor disc was of less importance than having a new disc with a sufficiently large central hole to fit over the Austin’s driveshaft/bearings/rear hub assembly – and a diameter and thickness that matched the Honda disc. Going through the DBA catalog found a disc that looked pretty good - a Mitsubishi L300 front disc. The centre hole in the new disc had to be larger than 75mm – the L300 one was 84mm. (The machined adaptor will incorporate a centre’ing shoulder). 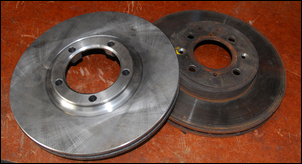 The L300 disc was fractionally smaller in diameter than the Honda (258 versus 262mm) and 1mm thicker (22 versus 21mm). Neither of these dimensional changes is critical – the pads can always be thinned to match the fractionally larger disc, and when you’re working within millimetres, it’s the width of the swept area rather than the overall diameter which is the important dimension – more on this in a moment. The offset of the new disc was not critical (not when an adaptor needed to made anyway) but in this case it was small, with a total height of 33.5mm. However, a potential problem is not answered by these specs. What is the width of the swept area of the L300 discs? If this is too small, the Honda calipers would need to be mounted so that the outer edge of the pad hangs over the edge of the disc. The way to find this information is to locate full-size drawings of the standard brake pads for each disc. These brake pad drawings are available (for Australian vehicles) on the Bendix Australia website. In the case of the L300 discs / Honda caliper, the pad drawings showed that things looked fine – the Honda pads would fit ‘within’ the standard swept area of the L300 disc. Here is the combination of Mitsubishi L300 disc, Honda Integra caliper and Austin knuckle and hub. This story does not cover the next steps – the making of caliper or disc adaptors, let alone matching master cylinders or getting the correct front/rear balance. But you have to start somewhere – and selecting the components in the first place is a more important and complex step than it first appears.